Life in Miami’s always-bustling Coconut Grove neighborhood was punctuated today by the added activity of 529 sailors from 41 countries preparing for tomorrow’s start of US Sailing’s Rolex Miami OCR. The six-day annual regatta, which will be sailed on Biscayne Bay for its 23rd time, is the second of seven 2011-2012 ISAF Sailing World Cup regattas and, as such, plays host to elite sailors from around the globe, with an emphasis on those preparing for the London 2012 Olympic and Paralympic Games. The day started early with registration at the U.S. 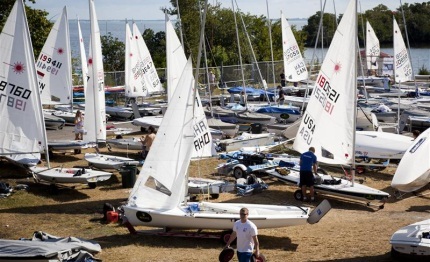 Sailing Center, which is serving as the event’s headquarters and staging area for Lasers (One Person Dinghy Men), Laser Radials (One Person Dinghy Women) and 470s (Two Person Dinghy Men and Women). Next door, Stars (Men’s Keelboat) used the Coral Reef Yacht Club’s two two-ton hoists to launch throughout the day for a bit of practice, while another door down, Finns (One Person Dinghy Men Heavy) tuned up at Biscayne Bay Yacht Club. Still farther down the road, but not by much, Paralympic classes (Single Person 2.4mR, Two Person Skud 18 and Three Person Sonar) used the expansive and accessible Shake-A-Leg facilities, while RS:X (Windsurfer Men and Women) sailors spread their sails on the lawn of Coconut Grove Sailing Club, nearest to the “The Grove’s” hub and shopping/dining destination “Cocowalk.” And as if that were not enough host venues to make an organizer’s head spin, across the bay at Key Biscayne Yacht Club and Miami Rowing Club, the Elliott 6m (Women’s Keelboat Match Racing) and 49er (Two Person Dinghy Men High Performance) sailors readied physically and mentally for tomorrow’s out-of-the-gate challenges. To see him sail, one would barely notice that LeBlanc is missing his left arm below the elbow. In his 13’ 8” long, one-person keelboat, he attracts attention less because he is disabled and more because his head is the only thing that shows above the boat’s small cockpit, which seems to hug the rest of his body like a glove. He chooses to steer with foot pedals rather than a forward tiller, which is the option most often chosen by paraplegics. Nine of the top ten teams in the ISAF World Rankings are here to compete in the Women’s Match Racing event, including those that took the gold, silver and bronze medals in Perth at the class’s Worlds: respectively, USA’s Anna Tunnicliffe (Plantation, Fla.) /Molly Vandemoer (Stanford, Calif.) /Debbie Capozzi (Bayport, N.Y.); Great Britain’s Lucy Macgregor/Annie Lush/Kate Macgregor; and France’s Claire Leroy/Elodie Bertrand/Marie Riou. Other top-five competitors from the ISAF Worlds competing here are Laser Radial gold medalist Marit Bouwmeester (NED) and silver medalist Evi van Acker (BEL); 470 Men’s gold medalists Mathew Belcher/Malcolm Page (AUS); 470 Women’s silver medalists Hannah Mills/Saskia Clark (GBR); and Star gold medalists Robert Scheidt/Bruno Prada (BRA). Seemingly the underdogs when compared to Scheidt/Prada (who, together, have won two Olympic gold medals), John Foster and his son Johnny Foster have only to mention their own Olympic history to be re-considered a threat by virtue of experience. The 74-year-old father has represented the U.S. Virgin Islands in Star class at five Olympic Games, starting with Munich in 1972 and finishing with Barcelona in ’92, while his 48-year-old son has crewed with him at three of those. (John also competed on his country’s bobsled team at the 1988 Winter Olympics.) The team has been officially designated the USVI’s representative at the upcoming Olympic regatta but first must qualify the USVI for its country berth. The next chance for that is at Hyeres in April and Scheidt/Prada will in no small way be a help in preparation for that. “That’s why we are here, to match our speed with theirs and come to a conclusion of whether it’s the tune of the boat or our own abilities that are the difference,” said John Foster, who thinks nothing of his age as the oldest here at the Rolex Miami OCR. “Growing old is inevitable; growing up is optional,” he said with a wink. For fleet racing in the Olympic classes, the Rolex Miami OCR will consist of a five-day opening series (Monday - Friday) and a double-point medal race (Saturday). The top 10 finishers in the opening series of each class will advance to the medal race. For match racing (Elliott 6m), which makes its debut in the 2012 Olympic Games, the regatta will consist of an opening series, a knockout series, and a sail-off for boats not advancing to the knockout series. Competitors in the Paralympic classes will have five days of fleet racing (Monday-Friday) and no medal race. Medals will be awarded to the top three boats in each Olympic and Paralympic class on Saturday, January 28. Torna a Pozzallo il premio internazionale "Trofeo del Mare"